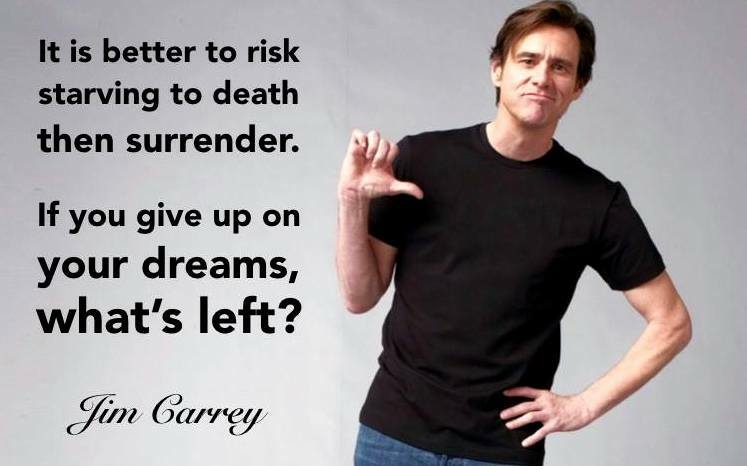 In 1990 Jim Carrey, a broke, unknown 28-year-old comic in LA, decided to write a check to himself: for $10 million. Jim went from year to year, check in pocket, striving to make the money he had committed to pay himself, without luck. Then, in year 4 of the five years, at 32 years old, Jim landed his first major role in ‘Ace Ventura: Pet Detective, followed by ‘the Mask’ and ‘Dumb and Dumber’. To understand what an amazing story this is, rewind to Jim’s early years. At 15, he got his first gig, at the Toronto’s Yuk Yuk’s club. His dad drove him there, and he wore a yellow suit his mother made. Jim’s debut bombed. But his father kept encouraging him, so Jim dropped out of school at 16, and moved to Hollywood to seek his big break at 19. It was a decade later that, still struggling, Jim wrote himself the check. After four years with the check in his pocket, Jim’s dad passed away in 1994. Jim slipped the check in his wallet into his dad’s casket at the funeral, to thank him for believing in Jim’s dream. It was just a year after that, that Jim achieved his $10 million success. Since then, his movies have gone on to gross over a billion dollars. Whatever struggles you have had in the past, what commitment do you make to your future? If you were to write yourself a check today, to cash in five years from now (that’s 2021! ), how much would it be for? What do you commit your life to be like, in quality as much as quantity? And what impact will you be having in the world? Once you’ve got your vision clear, go take action!